Our goal for Bathroom remodeling and renovation: Create a personal space that is a beautiful, innovative, and inviting as well as functional. ABF Remodeling has a team of designers with the experience and the products to transform your old bathroom into the beautiful, luxurious bathroom of your dreams. ABF Remodeling creates bathrooms from the concept of the dream in your imagination to a completed project. 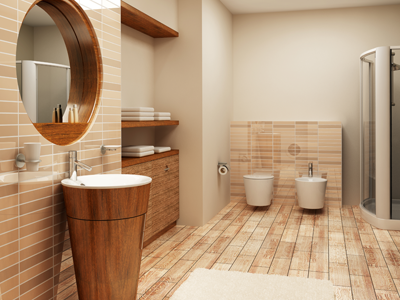 Your new bathroom will provide you with a lifetime of pleasure & enjoyment, while increasing the value of your home. PROVEN FACT: Upgrading bathrooms (especially master bath), kitchens and/or elegant flooring are the most significant improvements a homeowner can make to raise the value of a home. With all we have learned in our three decades of home improvement remodeling, we know how to turn you concept into a magnificent realty for your pleasure, always keeping in mind quality, longevity, budget, and stunning appearance. Our primary goal is your complete and total satisfaction in your bathroom remodeling project. Whether a shower, a tub (surround, insert, or roman), steam shower or a floor, our principle goal remains the same: customer satisfaction and long-term, maintenence-free craftsmanship. Your bathroom(s) should be thought of as a sanctuary. The place where you retreat too, freshen up, a place of stress releif, and where you prep yourself for social events and work. ABF Remodeling can design a beautiful master bath that will turn waking up and getting ready a joy rather than a painful task. Bathroom remodels are one of the most popular of all home improvement projects. A bathroom should be a place for relaxing, stylish, efficient and comfortable. Improving the look and feel of your home’s bathrooms add immeasurable comfort, enjoyment, and can drastically improve the value of your home. A true investment in your home! ABF Remodeling redesigns bathrooms with new and innovative ideas to maximize the use of space while staying within your budget. If we need to move walls, changes fixtures and utilities to increase floor square footage and storage space. A bathroom remodeling project is a great time to upgrade your plumbing systems, fix weak water pressure issues, upgrade flooring and walls, or repair leaky water faucets. Expert craftsmanship and using high-quality materials will ensure your remodel will last the lifetime of your home. Bathroom showers and bathtubs: A shower base can be custom-size, floor to ceiling using coverage with ceramic, porcelain, granite or marble tile with river stone borders. Shower fixtures can be installed in wall or on the ceiling to add a unique touch. Shower doors can be custom-made with various styles of glass. Vanities: Those six little inches added on to the standard 30″ vanity height can save your back from repeated daily strain for years to come. It also provides extra storage without taking up additional horizontal space. Walk in showers: Oversized or Jacuzzi tubs have become obsolete in Nevada. With water conservation a real concern walk in showers provide a great alternative for luxury and relaxation. Clear glass enclosures create the illusion of space in even the most cramped bathrooms. The glass also lets you see the custom tile or stone that will replace the plastic old style shower walls. Using tile or stone shower pans also reduce the risk of slipping in the shower. Safety, water conservation and stylish. You can’t go wrong! Redesigning or reconfiguring the layout of your bathroom is important but is only part of our service. Much like any project, there are going to be various improvements and upgrades that are available. Informing homeowners as to which upgrade (or combination of upgrades) is another way we build trust and a solid relationship with our clients. Providing that assistance to our clients who may not be familiar with these availabilities, is vital for long-term happiness in their decision and also helps facilitate new ideas of how to best use the space in accordance with your budget. Give us a call at 281-855-3400 and let us create the bathroom of your dreams! Or fill out the information below and one of our consultants will contact you as soon as possible. ADDRESS: 8719 HIGHWAY 6 N.